We’ve put together an in-depth guide to the best cash-back credit cards, some of which are from our partners, and how to pick the right cash rewards program for your needs. Whether you are looking for the best cash-back credit card offer for a sign-up bonus, groceries, and/or gas, we’ve got you covered. Learn more about how cash-back credit cards work, and which picks make the most sense for your goals. The marquee feature is the fact that this offer earns up to 5% cash back, but the card is packed with a deep bench of perks, which is rare in the cash back category. It's a leading pick no doubt. With 6% cash back at U.S. supermarkets (up to $6,000 per year) this card is well worth the annual fee if you spend a lot on groceries. 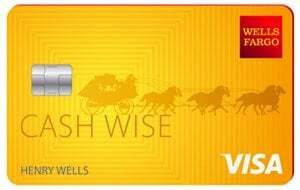 This card comes with unlimited 1.5% cash back and a 0% APR offer on both purchases and balance transfers. You can also earn up to $250 back in your first year of card membership. The 4% cash back on dining and entertainment make this card well worth the annual fee if your spending naturally skews in that direction. The large sign up bonus also makes this card a stand out. This card offers a flat 2% cash back rate on all purchases - 1% when you make a purchase and an additional 1% as you pay for those purchases. It also comes with an 18-month 0% intro APR offer on balance transfers. It’s little surprise that cash-back cards are some of the best credit cards on the market. Cardholders earn rewards for using their cards to make purchases, and can qualify for new cardholder bonuses that pay out as much as $200 in the first few months after opening an account. Whether you want flat cash back on all of your spending, or a card that doles out bonuses for spending on gas, groceries, restaurants, and other categories, there’s a credit card out there that’s perfect for you. Best of all, very few cash-back cards carry an annual fee, making them suitable for people with all levels of spending needs. How can you get cash back from a credit card? Sign-up bonus and ongoing rewards -- A card needs to rank well either for the size of its sign-up bonus or high cash-back rate. Fees -- Annual fees are justifiable for some high-quality offers (don’t worry, we’ll tell you when! 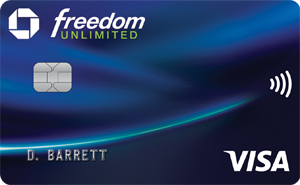 ), but the majority of the cash-back cards we covert include $0 annual fees. Balance-transfer fees should also either match or beat the competition. APRs -- Including a 0% intro APR for purchases and/or balance transfers has become table stakes in this category and it’s a requirement for inclusion. As a personal finance nerd and credit card rewards enthusiast, I don’t just recommend credit cards, I use them, too! I’ve read through hundreds of card offers, picked apart every detail of the fine print, and looked for cards that offer something truly unique to stand out from the pack. Perhaps most importantly, I’ve collected thousands of dollars in cash back, free travel, and other perks without paying a dime in interest by using credit cards to pay for purchases I'd make anyway. Card issuers earn fees from merchants every time you use your card to make a purchase, which helps them afford to pay rewards to cardholders who use a particular type of card. A cash-back credit card gives cardholders cash back when they make a purchase with the card. Cash back is usually accrued as a percentage of the amount a cardholder spends on purchases, typically ranging from 1% to as high as 10% on select purchases. A 2% cash-back credit card would reward you with $0.02 per $1 spent. A 3% cash-back credit card would reward you with $0.03 in rewards per $1, and so on. Cash-back credit cards generally fall under one of three different categories of rewards programs. Which one is best for you depends what you spend, where you spend, and how much effort you want to put into collecting cash back on every swipe of your card. Flat cash-back credit cards -- These are the simplest cash-back cards, because they offer flat cash-back rewards every time you make a purchase. These cards usually offer unlimited cash back equal to 1% to 2% of your purchases. The key advantage of these cards is that all spending earns rewards at the same rate, making them a great pick for a “one-card” wallet. Rewards are typically unlimited, so you earn the same cash-back rate whether you spend $10 or $10 million. The Capital One® Quicksilver® Card - 0% Intro APR for 15 Months, American Express Cash Magnet® and Wells Fargo Cash Wise Visa® Card are both leading flat cash-back cards. Bonus category cards -- Some cash-back cards offer enhanced rewards rates on certain types of spending. For example, the Bank of America® Cash Rewards credit card offers 3% cash back on a category of your choice, 2% cash back on grocery stores and wholesale clubs, and 1% cash back on everything else, with bonus rewards earned on the first $2,500 of total spending in bonus categories each quarter. Bonus category cards are best for people who spend a disproportionate amount in a particular category (groceries or gas, for example). The Capital One SavorOneSM Cash Rewards Credit Card is another bonus category card earning 3% cash back on dining and entertainment and 2% cash back for groceries, and Blue Cash Preferred® Card from American Express rewards U.S. supermarket spending at up to 6% back. Rotating bonus category cards -- These cards offer a high cash-back bonus on certain types of spending, in addition to a flat amount of cash back on all other types of spending. Chase Freedom® is a popular rotating bonus category card that offers 5% cash back in rotating categories you activate (on the first $1,500 of spending in quarterly categories), and 1% cash back on all other spending. Discover it® Cash Back pays 1% cash-back on regular purchases, and 5% cash back at different places each quarter like gas stations, grocery stores, restaurants, Amazon.com, or wholesale clubs up to the quarterly maximum ($1,500 of spending) each time you activate. Our handy checklist can help you decide if a cash-back credit card is right for you. If most or all of these statements apply to you, you’re probably a good candidate for a cash-back credit card. You have good credit -- Cash-back credit cards typically require a better credit score than credit cards that do not have rewards programs, but you don’t need perfect credit to qualify. Fair credit (scores above 650) are generally good enough for most cash back offers. You don’t travel much -- Cash-back credit cards are an excellent alternative to travel credit cards because they offer rewards that can be redeemed for cash, which can be spent however you’d prefer. That said, travel cards can offer more financial value for travelers, and tend to carry features (such as no foreign transaction fees) that cash-back rewards cards don’t always offer. You won’t carry a balance -- As a rule of thumb, a single month of interest is roughly equal to the amount of rewards earned by a 1.5% cash back card. For this reason, it doesn’t make sense to spend heavily to accrue rewards if it means carrying a balance at a double-digit interest rate. Carrying balances is a losing strategy. You can maximize bonus categories -- Bonus categories are the real killer feature of cash-back rewards cards. Many cards offer bonus cash back for spending on gas, groceries, restaurants, Amazon.com purchases, and more. These bonuses can be very lucrative considering some pay out as high as 5% to 10% on purchases. There are five basic features that tend to separate the best cash-back cards from the worst. These details are often lost in the fine print, but we’re here to shine light on the things that can guide you toward picking the best card for you. A low minimum redemption threshold -- Cash back rewards don’t have any value unless you can cash them in. Some cards require you to earn as much as $50 in rewards before they can be redeemed, whereas other cards have no minimum redemption requirement. People who have lower spending needs may be smart to prioritize a card that offers a no minimum redemption feature, even if it offers a lower cash back rate per $1 of spending. New cardholder bonus -- Qualifying cardholders can get a new cardholder bonus that offers as much as $150 in bonus cash back for opening an account and meeting a minimum spend requirement. For example, many of our favorite cash-back cards offer $150 in bonus cash back after spending $500 in the first 90 days after account opening. Free FICO® scores -- It’s becoming more common for credit cards to offer free access to your real FICO® credit score. This is a useful feature for people who value being able to watch their credit score rise or fall over time. No annual fees -- Luckily, annual fees are relatively rare in the world of cash-back credit cards. High rewards rates offered by bonus category cards are particularly compelling for cardholders who have large spending needs in certain categories. 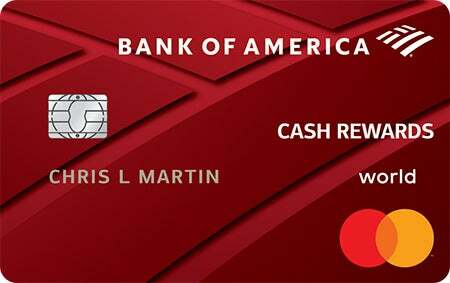 The Bank of America® Cash Rewards credit card offers a lucrative 3-2-1 rewards program that pays 3% on a category of your choice, 2% on groceries and wholesale clubs, and 1% cash back on all other types of spending. Whether it is a good card for you, however, depends on your spending needs. 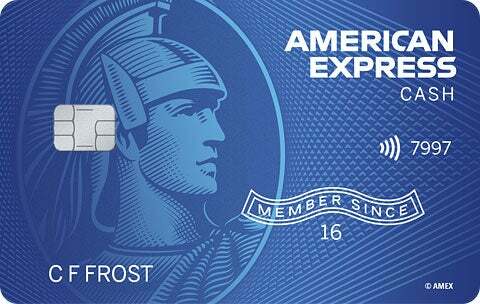 Let’s use an example where you spend $100 per month on gas, $400 on groceries and wholesale clubs, and $1,000 on other purchases to see how the card’s rewards program compares to 1.5% cash back offered by Capital One® Quicksilver® Card - 0% Intro APR for 15 Months. In this example, the Capital One® Quicksilver® Card actually offers higher rewards through its flat 1.5% cash back program than Bank of America® Cash Rewards credit card because so much of the spending is outside the bonus categories. Of course, if the example were changed so that the majority of the spending was in bonus categories, then the Bank of America® Cash Rewards credit card would offer more value. There is no best card for everyone since no two people spend exactly the same way. Continuing with the above example, a cardholder who uses Capital One® Quicksilver® Card - 0% Intro APR for 15 Months and Bank of America® Cash Rewards credit card in tandem can maximize their rewards by using them for different types of spending. Purchases that earn bonus rewards could be put on the Bank of America® Cash Rewards credit card, while Capital One® Quicksilver® Card - 0% Intro APR for 15 Months can be used to maximize rewards on all other types of spending. We’ll use the same budget of $1,500 per month, which was broken down into $100 of gas, $400 of groceries, and $1,000 on all other purchases. If you optimized your spending, you could earn $26 of monthly rewards by using two different credit cards. Of course, carrying multiple cash-back credit cards isn’t for everyone, and the examples above illustrate why that is. 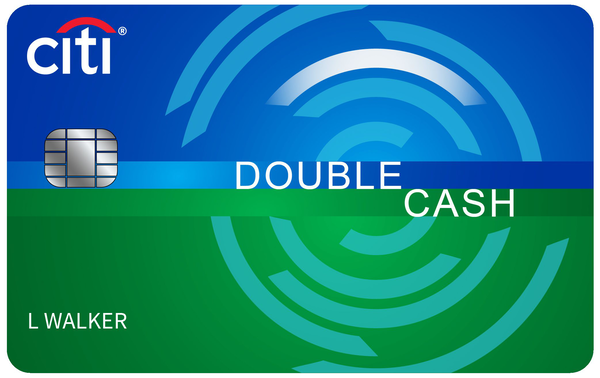 Using two cash-back credit cards to maximize rewards results in $26.00 in cash back rewards per month. 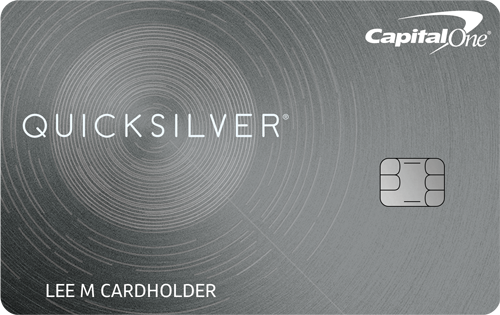 That’s just $3.50 more than you would earn by using Capital One® Quicksilver® Card - 0% Intro APR for 15 Months by itself. You might reasonably conclude that juggling multiple cards and payment due dates isn’t worth the hassle of earning a slightly higher rewards yield on your spending. Besides, since many credit cards have a minimum redemption threshold, dividing your spending across several different cards may mean waiting a very long time before you are able to cash them out. We recommend most people stick to just one card, maybe two, to maximize their rewards without making their financial lives overly complicated. Don’t carry a balance -- If you plan to carry a balance, a 0% intro APR credit card is a better solution than a cash-back credit card. The cash back you earn on purchases typically amounts to just one month of interest charges, so carrying a balance is almost always a losing strategy. Enroll in bonus categories -- If your card offers bonus categories, make sure you enroll. Most cards that have rotating bonus categories require you to enroll every three months by logging into your account and clicking a link. Set up reminders so you can be sure to maximize your rewards. Get a new cardholder bonus -- Sign-up bonuses add a lot of upfront value to cash-back credit cards, as many offer as much as $150 in bonus rewards for spending as little as $500 within 90 days of account opening. To put that in perspective, you’d have to spend $10,000 at a flat 1.5% cash back rate to earn $150 in ordinary rewards. Use an issuer’s shopping portal -- Many card issuers have an online portal that pays bonus rewards when cardholders use it to navigate to an online retailer. These bonus rewards can add up fast, as many offer 3% to 10% cash back on purchases you’d make anyway. Before you shop online, see if your card issuer has a relevant bonus offer. Look for rewards bonuses and multipliers --Customers who are Preferred Rewards clients with Bank of America, for example, can score an even larger bonus of 25% to 75% on their rewards. Depending on your status with the card issuer, these bonuses can substantially increase the effective rewards yield of a cash-back credit card. This is just one example of how having a banking relationship across multiple products (not just credit cards) can increase the value of a cash back card.